Apple on Monday unveiled a new, $999 “education only” 21.5-inch iMac. The new iMac—which is available only to authorized education purchasers, not educational customers buying through Apple's public-facing education store, is cheaper but less powerful than the $1200 base 21.5-inch iMac offered to all consumers. 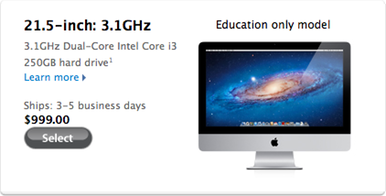 Unlike that $1200 iMac, which sports a 2.6GHz quad-core Intel Core i5 processor, the education-only iMac relies on a 3.1GHz Intel Core i3 dual-core processor. The education-only iMac also sports a 250GB hard drive, 2GB of RAM, and 256MB for the graphics card, all of which come in at about half of the respective specs of the base iMac. The education-only iMac also lacks one of Apple’s fancy new high-speed Thunderbolt peripheral ports; it does, however, have all the other features of the basic iMac, including one FireWire 800 port, four USB 2 ports, and a Mini DisplayPort. It also sports a FaceTime HD camera. Apple has a history of offering scaled-down Macs at cheaper prices for educational institutions; it’s made similar offers with eMacs and iMacs in the past.